This easy Caramel Apple Cream Cheese Spread is the perfect sweet touch to a tailgating menu or any gathering of friends. A good friend of mine recently told me all about this super easy Caramel Apple Cream Cheese Spread. She said she served it at a tailgating event and watched it be devoured right before her eyes. It is good. I mean really good. And it could not be simpler to make. Seriously, it’s so easy, it’s sort of like cheating. Three ingredients, plus about three minutes is all it takes (if that long) to put this sweetened up cream cheese spread together. Of course you’ll need more time to cut up the apples or pears or whatever you want to serve it with. A spoon perhaps? Begin with some cream cheese. Drizzle the top with caramel sauce (homemade or store bought will do). Then sprinkle it with a generous amount of toffee bits. That is about as simple as it gets. 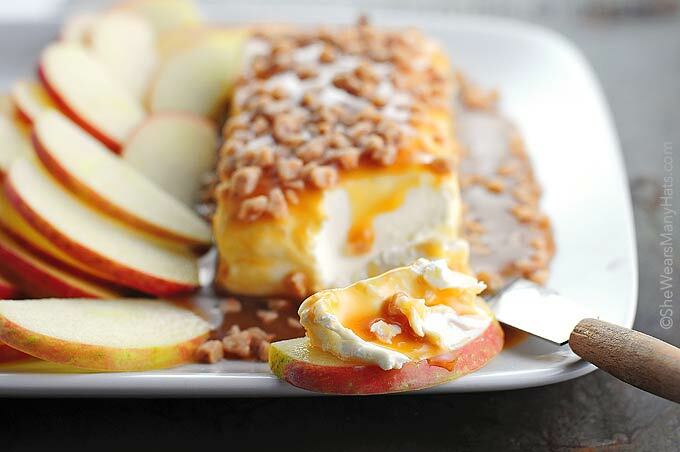 But don’t let the simpleness of this Easy Caramel Apple Cream Cheese Spread fool you. It’s sneaky satisfying. You’ll see. I promise. 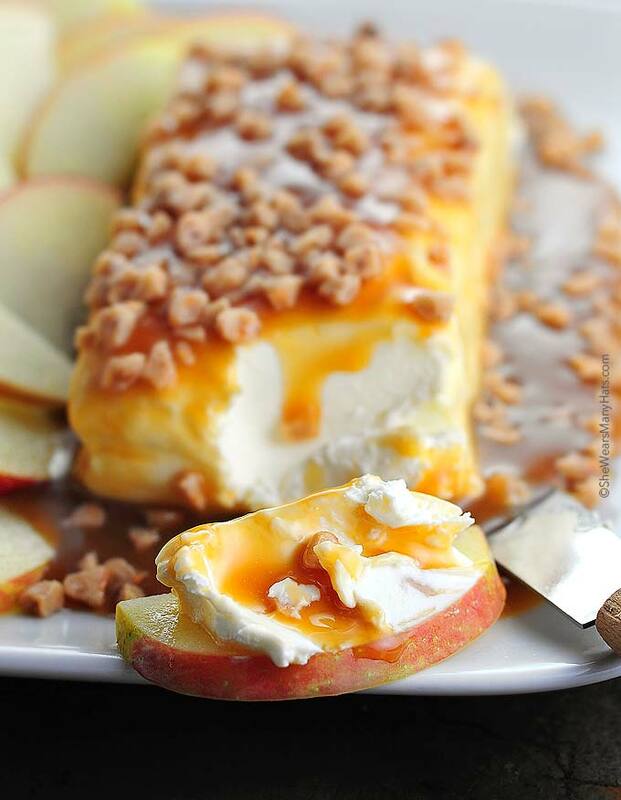 The simplicity of this Caramel Apple Cream Cheese Spread makes it quite perfect for tailgating. Of course you don’t have to be in a parking lot to enjoy it. Serve this cream cheese spread inside of your home for your next get-together and watch everyone cheer, even if there isn’t a football game on! P.S. You can certainly use store-bought caramel sauce, but if you have some extra time, this Salted Caramel Sauce recipe is my favorite and such a great addition for so many other treats or maybe warm beverages, like hot chocolate or coffee! This easy party spread is super satisfying and so easy to make and perfect for any fall entertaining. Place cream cheese on a serving dish. If you'd like, shape into a round and indent in the center to hold more caramel. 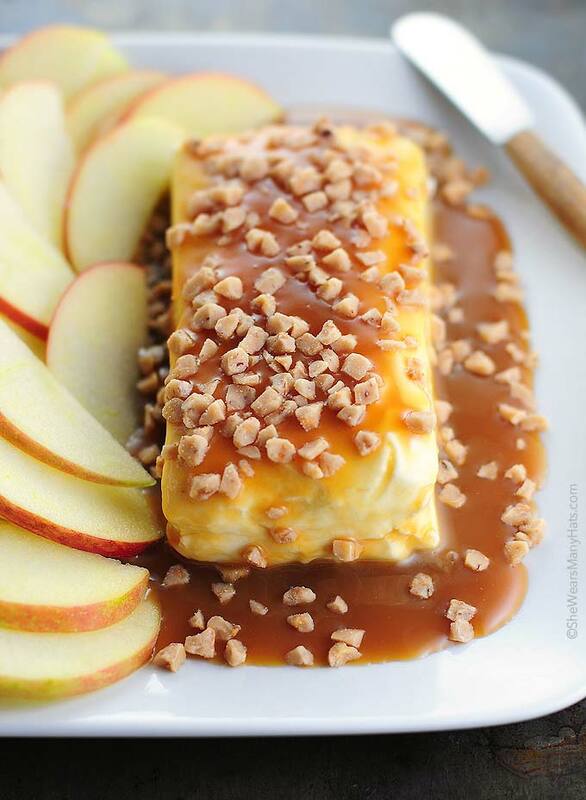 Pour as much caramel sauce as you want evenly over cream cheese. Sprinkle with a generous helping of toffee bits. Simple and yummy and I love that the instruction is to pour as much caramel as you like! Oh. My. Gosh. You are a genius!! 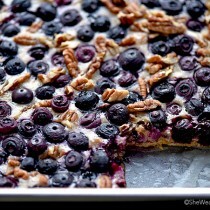 It’s great to have an easy recipe that looks as nice as this one does to bring to a party. This one is perfect for upcoming holiday get-togethers. Amy!! 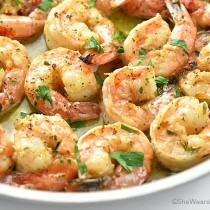 I love quick and delicious appetizer ideas like this!! I love how quick and easy it is but looks so elegant!! Pinned and seriously making this!!! Can’t wait! Gorgeous! I’m licking my screen! Instead of toffee bits you could use chopped pecans. Also, you could serve with cinnamon pita chips. Can you add toffee bits to the list of ingredients? It would save me a 2nd trip to the store. Oh my goodness, Mary! Thank you for pointing that out to me. I have no idea what happened to the toffee bits in the recipe, but they are there now. So sorry for any trouble. And thank you, again. I think i would use )peanut)nut topping that’s used for ice cream sundaes. Just like on a Carmel apple. I think salted nuts would be a fantastic addition! Ooooh … we like that one too! That is one of my very favorites during the holidays. What do you use to keep the apples from browning? A little bit of lemon juice works like a charm. I slice the apples, place them in a bowl and toss them with fresh squeezed lemon juice, then cover and refrigerate until ready to serve. 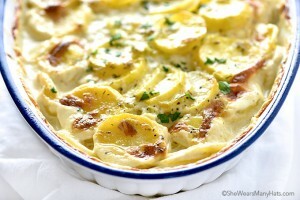 This looks yummy ~ pinning! I was thinking the fruit needed the lemon. Maybe add at in the instructions for people who don’t know? Anyway, thanks for the great idea! Just an FYI, everyone thinks you can only use lemon juice to keep apples, bananas and other fruit from turning brown, here’s another tip: orange juice works just as well! If you soak apples in pineapple juice they will keep for days. I use only pineapple juice. It keeps fruit from turning brown and does not flavor the fruit. It works GREAT EVERY TIME. Thank for this great appetizer, or should I say just a great dessert. A little lemon lime soda also does the trick! Slice and refrigerate and orange juice for an hour or so . Be sure to drive them off before you put on the platter . When I made this, I used pink lady apples and granny Smith. The granny Smith had browned, but the pink ladies did not. Don’t ask me why…but I made a mental note to use pink ladies…if you can find them. Absolutely love this idea, thanks Amy! Will definitely be bringing this easy app to my Thanksgiving party! I think I’m going to be serving it for an appetizer on Thanksgiving too! I featured this post in a Thanksgiving round-up today. I hope you don’t mind! Hi…I am making this in a few hours to take to a party…just wondering, do you use the entire 8 oz bag of toffee bits? I apologize for not replying in time for your party. I just use as much as I’d like. The last time I made it actually covered the top pretty good, and then later during the party added a bit more as the toffee bits sort of get gone, if you know what I mean. I hope it turned out great for you! I made this for small group last night and it got gone quickly. I’m glad I bought extra. Think I may have it for lunch tomorrow. 🙂 Is that wrong? 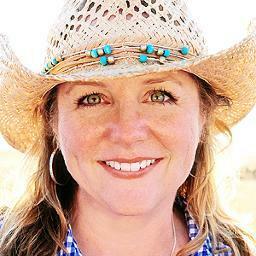 I love this idea so much Amy, thanks for sharing! 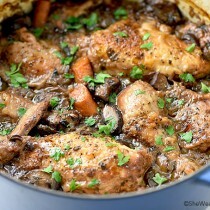 This looks delicious and so easy- absolutely my kinda recipe! Thanks for sharing! making some for a party tomorrow–can’y wait! I hope you enjoyed it, Nancy! I just got my annual box of ginger snaps and I think this would be great spread on those. Oh yes, Janet! The perfect combination. This looks delicious and so easy to make! Definitely have to try this one! Looking at the ingredient list for this dip, I knew that I would like it because logically all of the flavors compliment each other, however, when I actually prepared it, I was so blown away by how good it was! I used apples and I’m sure that that’s all I will ever use for it and I placed my cream cheese in the microwave for about 10 seconds alone and then another 10 with the caramel over it. Delicious! It so yummy, K! Your 10 seconds in the microwave tip is perfect. Thank you! Have to try this! Yummy. I’m considering making this with goats cheese instead of cream cheese. Do you think those flavors would work together? 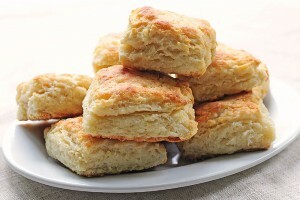 Do you think this would be good with vanilla wafers? Thanks for the recipe!! Hello all, does the cream cheese need to be at room temperature or fresh from the fridge?????? I had this at a recent wedding shower and it was delicious. I am planning to take this to holiday gatherings this season. Just ran across this recipe and looks delicious. Planning observing it for an upcoming party. What type of apples would you suggest to serve with it? I saw Granny Smith in the comments. Any others? Honey Crisp, Fuji, and Gala would be nice. Saw the comment on goat cheese — anyone try? If so, how did it work? 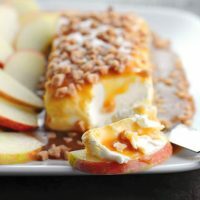 I wonder if this would be better if you made a diced baked caramel apple topping on goat cheese instead, I think goat cheese tastes better with warm fruit on top. Either way, let us know how it turned out. Does the cream cheese need to be at room temperature when serving? No. The softer it is the easier it is to spread but room temperature is not necessary. Wowzas! This was sooo easy and delicious! This treat is now a staple in our house for get-together!! It’s especially good when you have a pretzel and green apple with the dip. I know I may sound crazy! But to cut down on the sweetness a little I topped it with pecans instead of the toffee bits, and it was still delicious ! Thanks for this quick and easy recipe! Loved it. Can’t wait to try this. However, I don’t love salted caramel. Can I just eliminate the kosher salt? Thanking you in advance for your response. Yes, you may eliminate the salt. I made this and because we love caramel, I poked holes in the cream cheese with a bamboo skewer and it made it even more decadent…thank you delicious! 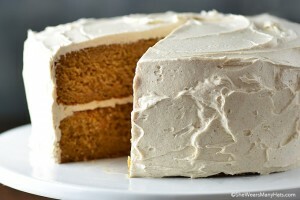 I have a recipe similar to this but it doesn’t have toffee bits. This looks so delicous–I can’t wait to try it!! Tried it for thanksgiving 2017 i would love to share a photo. Can I whip the cream cheese with the caramel so i can place it in a bowl?